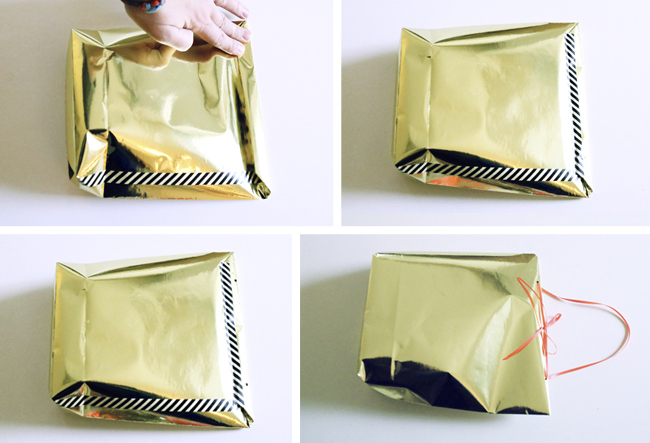 Don’t stress over all these possible wrapping issues, let me help you out. This month the Michael’s Makers were asked to come up with creative and fun holiday hacks and tips to help relieve some of that stress and make holiday entertaining and prepping fun! We were given 5 common holiday hiccups to choose from and I went with how to wrap difficult objects. 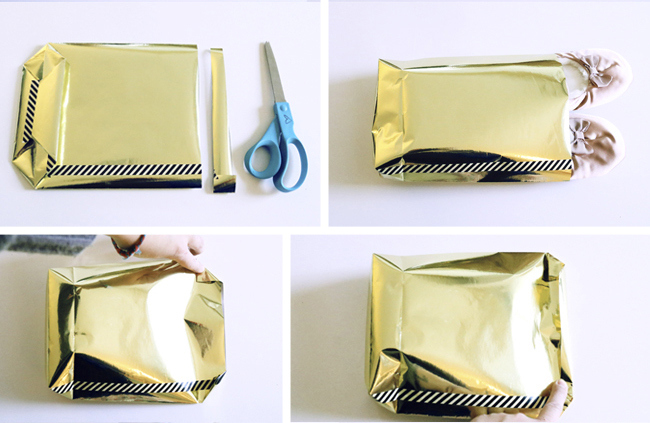 If you’re bored of the typical clothing gift boxes, you should try out this gift wrap idea. 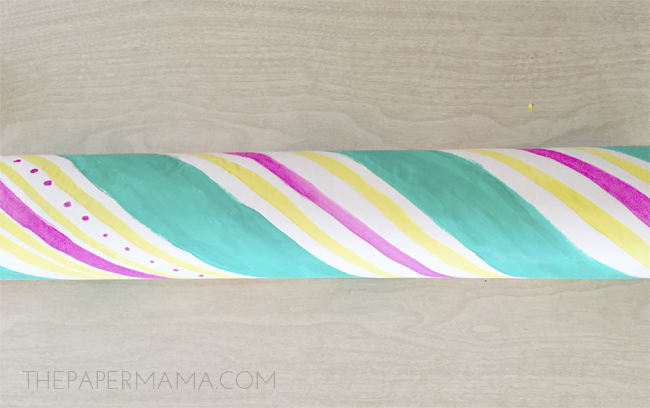 Use an old shipping tube (or you can buy one at Michaels) to hold those clothes and turn it into a piece of candy! Perfect for the kids. Step 1: Cut out a piece of paper that fits around the shipping tube. It should be about 8 – 10 inches longer than the tube on each end of the tube. Step 2: Lay that piece of paper flat over a tarp or plastic for painting. 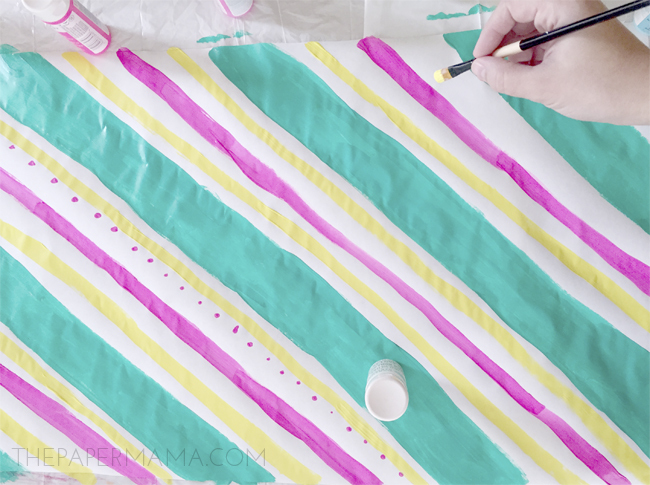 Freehand paint multiple diagonal lines with your paint colors. Let dry completely. Step 3: When the paint is dry you can start wrapping! 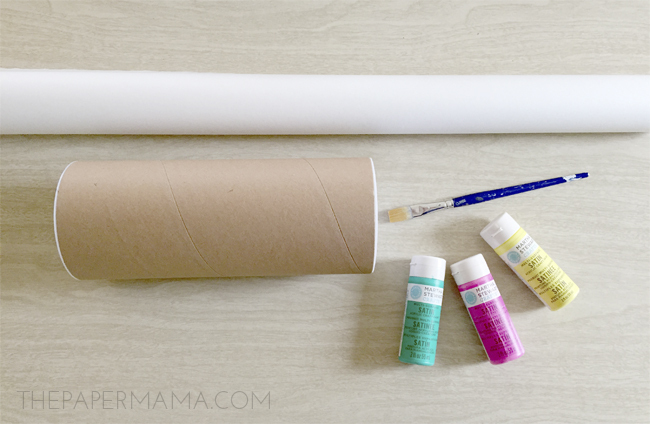 Tape the painted paper around the tube (with the gift inside). Step 4: Pinch the paper around the tube edges. 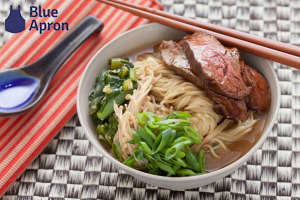 Secure the ends with some ribbon. 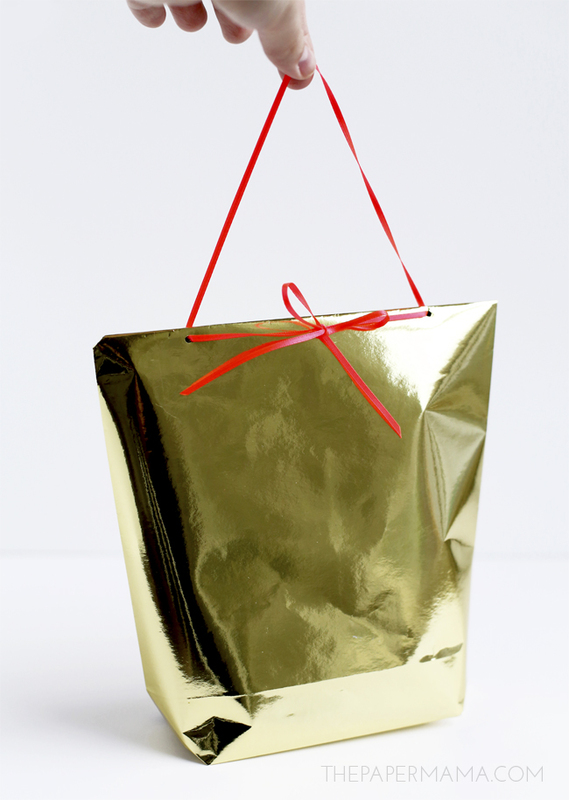 Do you have an awkward shaped item to wrap, but you’re out of gift boxes and pre made gift bags? No worries! 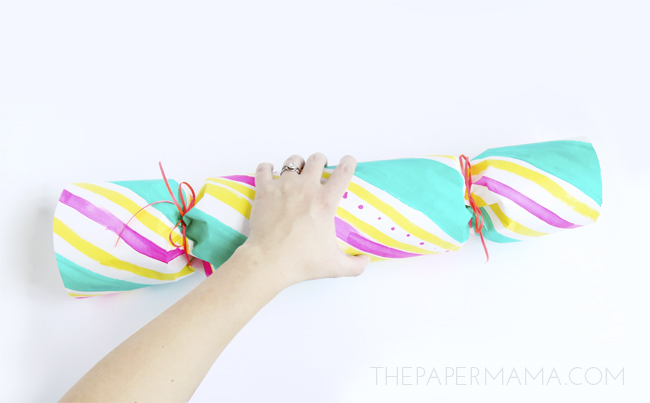 You can easily make your own gift bag using some sturdy wrapping paper (as long as the gift isn’t too heavy). I made this little mini gift bag to wrap up some slipper for my daughter. 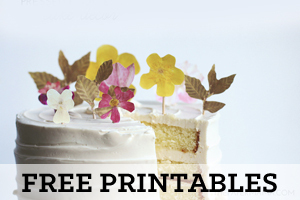 Step 1: Cut out a small section of wrapping paper. The length should be double the size you need for the final width. The height should be just a few inches bigger than the final height needed for the bag. 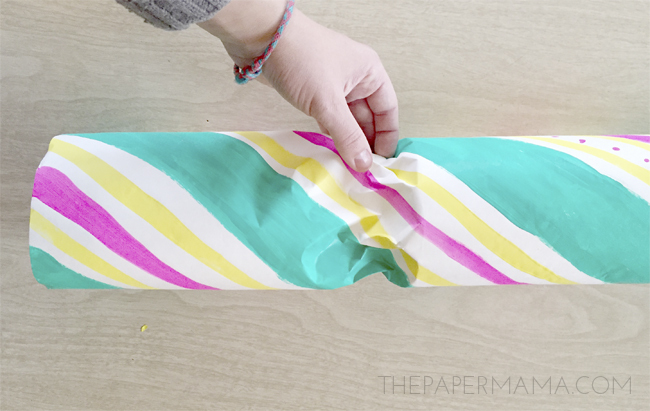 Fold over the long end of the wrapping paper, leaving about 1 inch of paper on the other side, and crease the paper. Fold over that little 1 inch piece of paper. 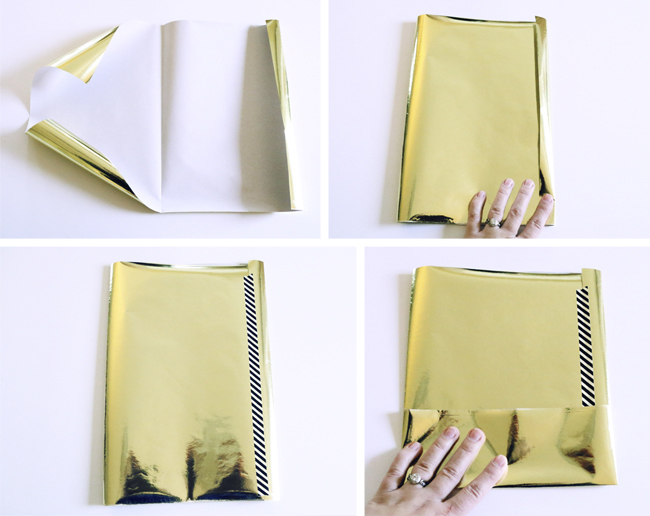 Secure this fold with a piece of washi tape. 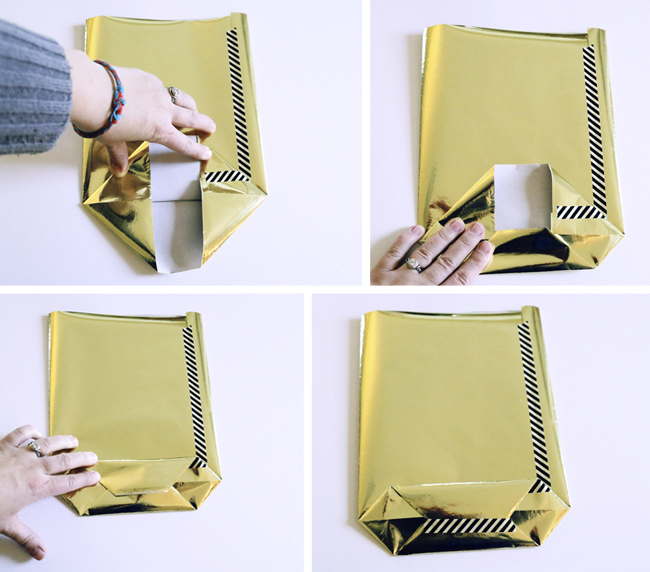 On one open end of the paper, fold up the paper and crease (this will be the base of your mini bag). Step 4: Open up that section of paper you just folded up for the base. Flatten it out so it creates two triangles on each side (don’t worry, this is easier than it looks when you’re actually doing it). 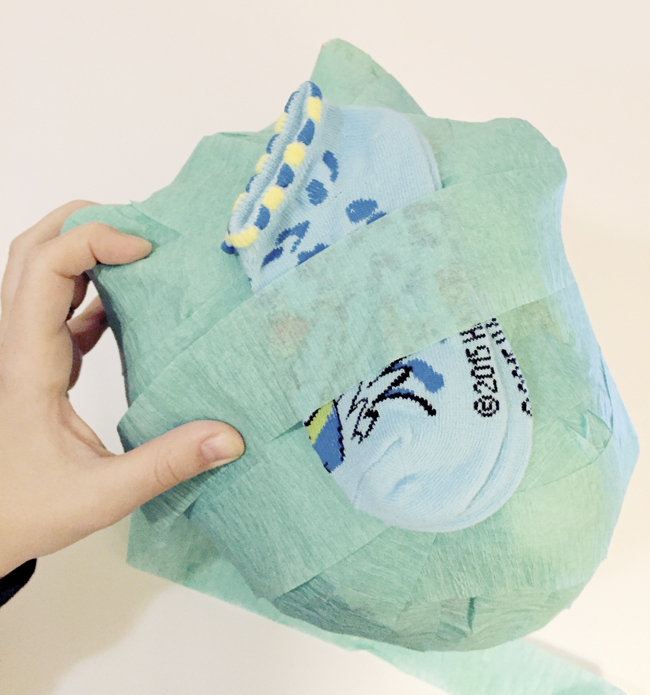 Fold up the top and bottom pieces of your base and crease. Secure this section with some more washi tape. Step 5: Use some scissors to trim the top of your bag into a straight line (if necessary). 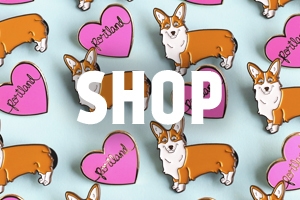 Add your gift (make sure the gift isn’t too heavy). Fold in little corners on the open end of the bag. Close the opening by folding over the top about a half inch. Step 6: Fold over the top one more time, and crease. 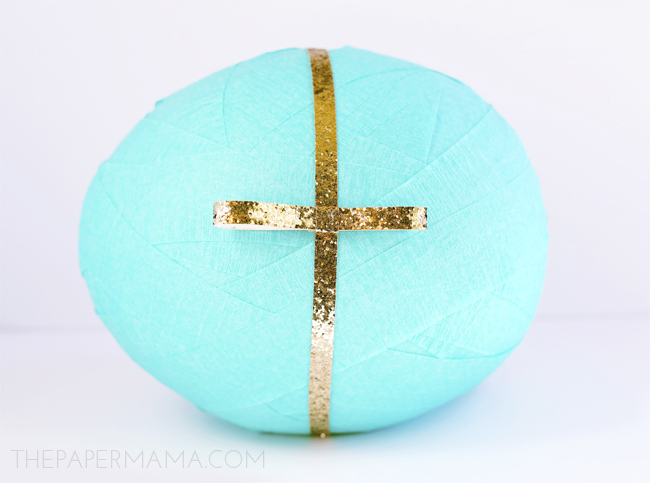 Secure with washi tape. 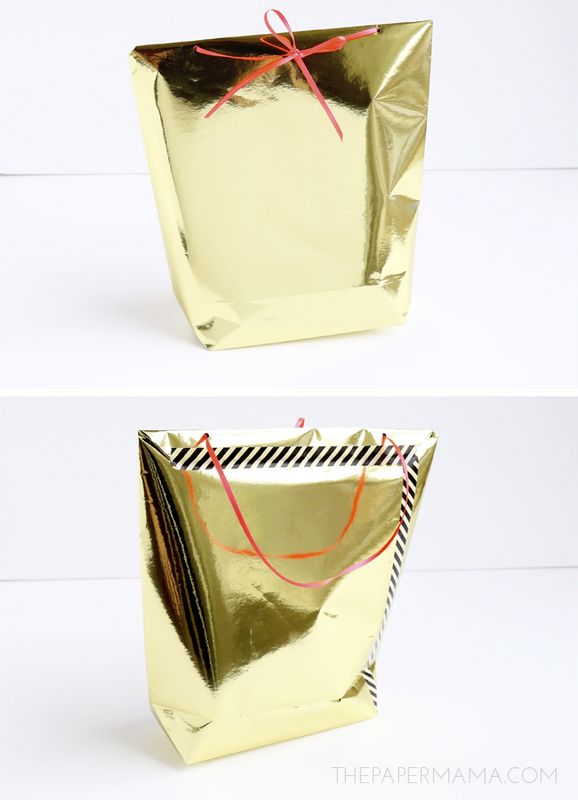 Use a hole punch to cut out two holes in the folds you just made at the top of the bag. String through some ribbon and double knot the ribbon on one side. Tie a bow. I’ve created quite a few surprise crepe paper balls in my past (kids love them), and I thought this would be the perfect way to wrap this awkward helmet I have for my daughter. We only had big bulky boxes left for wrapping, and I didn’t want to have that big box taking up room in our small home. The holiday surprise ball saved the day! 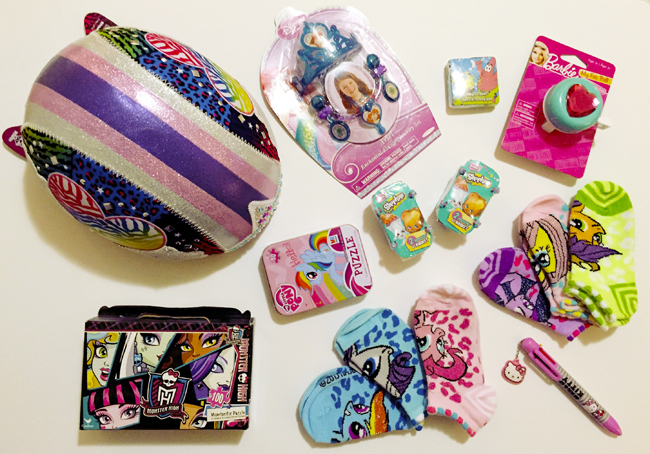 Step 1: Lay out all of the gift items. Decide which item you want to start with. I suggest starting with the bigger items first. In my case it’s the helmet and puzzle. 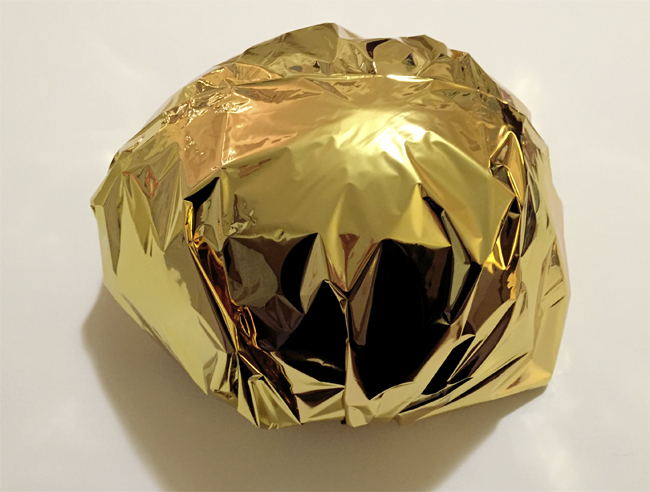 Step 2: To start out my surprise ball, I chose to wrap the final gift (the helmet) in some gold paper, so my daughter had something to open at the end of the surprise ball. 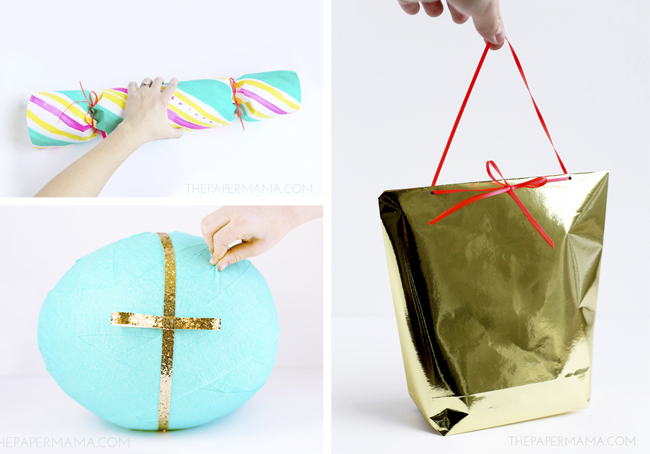 Step 3: Start wrapping the crepe paper around your first gift item. Basically you just keep wrapping and wrapping. If the paper tears while you wrap, don’t worry. Grab a piece of tape and tape the strip back together. Continue to add more gifts as you wrap. I suggest adding them to spaces that need a little more volume. 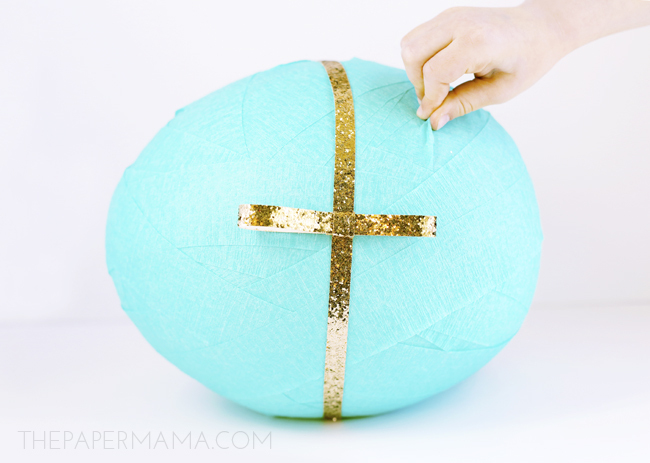 Step 5: When all the gifts are wrapped in the crepe paper, you can add a few wadded up balls of paper to the ball in any spaces that need more volume, to make the gift more round. 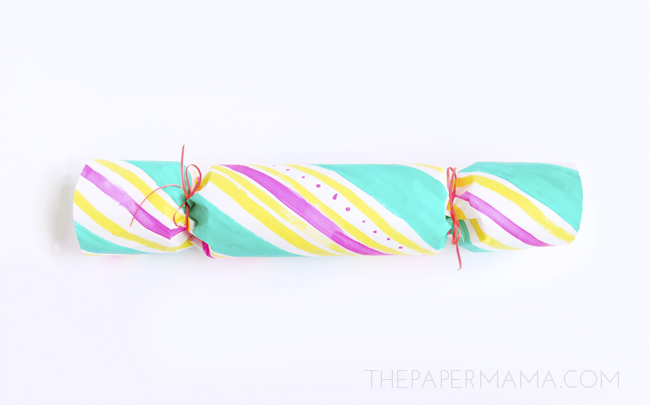 Wrap the crepe paper around the wads until they’re covered. 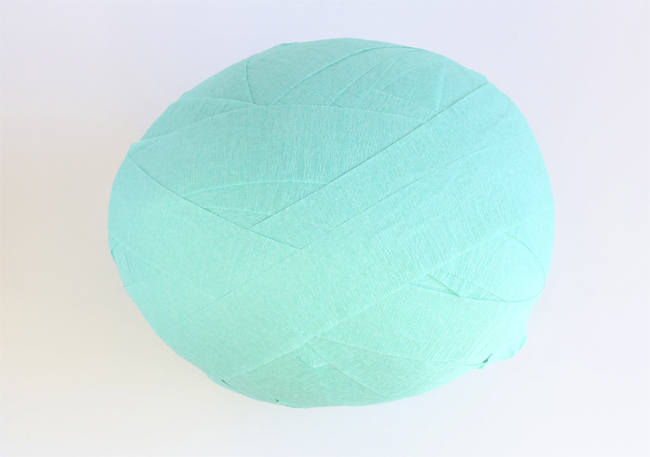 Step 6: Wrap a ribbon around the ball. I made a tiny bow out of glitter ribbon and hot glue for my gift. Do you feel like you’re ready to wrap? Michaels has tons of holiday project ideas and instructions on their Michaels.com, including gift wrapping, home décor, last minute gift ideas, hostess gifts and more. Check out the other four holiday hack topics and the unique ideas all of the makers came up with on Michaels blog, The Glue String. I was provided with a Michaels gift card to create this post.